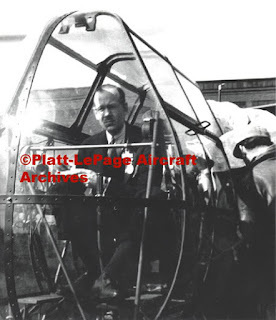 Dr .Wynn Laurence LePage was a pioneer rotary wing designer working with Harold Pitcairn, and Later with Kellett Autogiro, LePage designed the first line of autogiros, K-2, K-3, and K-4, establishing Kellet as manufacturer of good performing autogiros. In 1935, due to the effects of the economic depression in the 1930s, Laurence LePage left Kellett to become an independent engineer, and by 1935, LePage would meet and became partners with Haviland H. Platt, a mechanical engineer and patent expert with a number of rotary wing patents. They collaborated on a number of ideas for a helicopter, and upon hearing of the early flights of the Focke FA-61, they decided to investigate this promising development. In 1938 W. Laurence LePage traveled to Germany to view the Focke FA-61 Helicopter, and after much negotiation obtained an option to build Focke helicopters in the USA, but the deteriorating conditions between the two governments prevented a deal going through. In November of 1938, Platt and LePage formed the Platt-LePage Aircraft Company, and abandoned talks with the German government to import a Focke helicopter. They proceeded on their own to design a helicopter based on their patents and ideas. 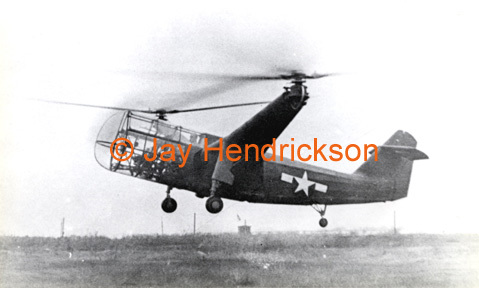 Design and construction was started on an experimental helicopter PL-3, with Laurence LePage keeping the U.S. Air Corps informed of their progress during the early construction of their machine. At this time there were no funds for the U.S. Air Corps to purchase a helicopter, so the Platt-LePage design went forward as a private venture, later with the passage of the Dorsey Bill H.R.8143, the U.S. Air Corps held a competition for Rotary Winged Aircraft, so Platt-LePage Aircraft redesigned the PL-3 to meet military needs, and would enter the Dorsey Bill competition. In July 1940 the Platt-LePage Aircraft Co. won the competition to build a helicopter designated XR-1 The first flight of the XR-1 took place in May 12 1941, a number of teething problems developed with the control system, causing delays in progress, along with test pilot Lou Leavitt refusing to fly the XR-1 in forward flight. In June of 1943 Col. H.F. Gregory took the XR-1 up and proceeded to fly the XR-1 at speeds of up to 100 miles per hour, and completed the first close course flight of the XR-1. By the summer of 1943 the XR-1 was flying with much better control, when on July 4, 1943 the XR-1 was damaged in a crack up due to the loss of a rotor blade, further slowing testing. In October 1943 the second model XR-1A made its first flight, and was found to have better flying characteristics than the XR-1, numerous flight tests were carried out, and by June of 1944 the XR-1A was flown from Eddystone Pennsylvania, to Wright field in Dayton Ohio, passing through a dangerous mountain pass and flying through a long stretch of bad weather, during which the XR-1A encountered a grounded Sikorsky XR-4 along the way. By August of 1944 rebuilt XR-1 was back in the air and slowly progress was made in solving the control problems. In March of 1945 just a few days after a new control system was installed that solved some of the problems with longitudinal stability, the Air Corps. would shortly cancel all contracts with Platt-LePage. As well as the seven additional YR-1A helicopters that were under construction. By this time the McDonnell Aircraft Co. which had invested in Platt-LePage Aircraft, in exchange for having McDonnell personnel learn helicopter design, had bought the rights to the PL-9 twin-engine twin-rotor design that became the XHJD-1 Whirlaway the first twin engine helicopter to fly in the USA. During this time period, Platt and LePage had proposed and patented the first Tilt-Rotor Aircraft design in the USA, but the small size and lack of capital of Platt-LePage Aircraft, along with lack of orders for military aircraft caused the Platt-LePage Aircraft Co. to shut down in August of 1946. The McDonnell Aircraft Co. obtained most of the helicopter patents from Platt-LePage during the liquidation of the company, along with the personnel responsible for the twin engine project. Robert Lichten an ex-Platt-LePage engineer went to Bell Helicopter and developed the Tilt-Rotor idea into the XV-3, an examination of the original patent by Haviland Platt shows a remarkable similarity between the two ideas, and Bell Aircraft eventually paid Haviland Platt for the use of his patent. One other notable designer came from Platt-LePage; a very young Frank Piasecki had his first helicopter design job at Platt-LePage, before going off on his own, to a brilliant career as one of the great designers of helicopters. There were a number of firsts at Platt-LePage Aircraft, in spite of their failure to enter full scale production of their helicopter. They proposed the first helicopter gunship, a large twin engine helicopter, and their early design work with the Tilt-Rotor concept. Later a number of people went on to become famous in the field of helicopter design, such as Frank Piasecki, Alan Price and Robert Lichten, all got their start at Platt-LePage Aircraft. Dr. Wynn Laurence LePage and Haviland Hull Platt have a place in the pioneering days of rotary wing flight, through their ideas and designs that began in the early days of helicopter experimentation, and have now become an everyday part of modern life. Welcome To Platt-LePage Aircraft Co. Archives. This site will discuss the pioneering helicopter work of Dr. W. Laurence LePage & Haviland Platt, along with their company Platt-LePage Aircraft, and their related helicopter and VTOL projects. Preserving and researching Platt-LePage Aircraft Co. data.